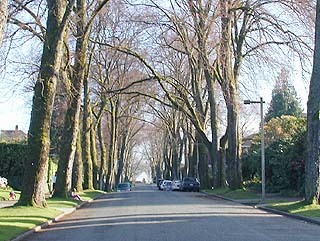 Seattle streets planted with trees planned by the Olmsted brothers are exceptionally desirable streets on which to live. Trees, parks, natural areas and forests inspire art and poetry by arousing emotions and filling our senses. We value those intangible qualities, knowing that they improve the health, beauty and quality of our communities. That value is usually considered incalculable. To serve a society that determines worth by attributing monetary value, research has been undertaken on the economic benefits of trees and open space. This research, compiled by the Trust for Public Land in a report “Economic Benefits of Parks and Open Space” and others, challenges the prevailing notion that it is always more profitable to remove vegetation and develop a piece of land than it is to preserve it. This research confirms anecdotal evidence about the value of trees and open space in a residential setting. It has also established the economic value of these elements in commercial development, in both suburban and urban settings, and economic impact to a community as a whole. Preserving trees and open space and creating parks should be an integral part of growth management by providing the amenities that offset increased density. Now research proves that providing it is not necessarily the economic burden developers and taxpayers expect. Trees, parks and open space within communities are essential elements contributing to quality of life, right after low crime and safe streets, according to researchers from the Regional Plan Association and the Quinnipac College Polling Institute. Residential neighborhoods well endowed with mature trees and open space are exceptionally desirable places to live and contribute to the stability and vitality of a community. How much is that worth in cold hard cash? The value of a single, mature tree can account for a minimum of $10,000 of the resale value of a home and typically is 15 percent of the property’s value, according to the National Arbor Day Foundation. On residential streets lined with large mature trees, the total economic impact is greater than the sum cost of the individual trees. In the lower part of Beverly Hills, Calif., where meandering streets are each lined with a different tree species such as blooming jasmine, coral tree and jacaranda, it has been estimated that removal of those trees would decrease property values by 25 percent. Where million-dollar homes are the norm, that is a substantial amount indeed. Given that a tree takes more than 40 years to reach maturity, its removal changes the quality and character of the area for decades, and that value is not always regained by the residential development that removed it. Mature trees also make increases in density more palatable to residents. In focus groups conducted for the city of Burlington, outside of Toronto, participants were shown photos of residential buildings at various densities in order to measure the community’s reaction to housing “intensification.” The participants were asked to rate the images. Consistently, the images of dwellings with mature trees and landscaping were ranked highly favorable, regardless of the density of the dwellings in the photo. Forty-eight percent of residents in Denver said they would pay more to live near a greenbelt. In San Diego County, a developer found he could increase the sale price of his houses by 25 percent by scaling back his development 15 percent and adding natural open space corridors visible from every home. A study of housing values near Philadelphia’s Pennypack Park found that the park accounted for 33 percent of the land value for lots abutting the park and its economic influence was felt up to 2,500 feet away. The park directly contributed to a net increase of $3.4 million in real estate value. Similar results are found for multi-family housing in an urban setting. Solara, a 238-unit apartment complex by Weber + Thompson for Simpson Housing in the Lake City neighborhood of Seattle, arranges housing in three buildings surrounding an urban courtyard. The units facing the courtyard are more desirable, are renting more quickly and for a higher price than the streetside units, thus compensating the developer for building at less than allowable site coverage. As the density of urban development increases so do the economic benefits reaped from urban parks, courtyards and plazas. Within an urban core these spaces provide public gathering spaces that are essential for civic life. And where people go, development and money soon follow. In New York City, the 9-acre Bryant Park was recently transformed from a derelict, unsafe place that people avoided into flower gardens and lawns, coffee kiosks and restaurants with hundreds of moveable chairs. Nearly 4,000 office workers and tourists visit the park per day, and 10,000 for special events. The park has spurred renovation of the retail area in the surrounding district, and occupancy rates, property values and rents have gone up. The park will be economically self-supporting in the next five to seven years and will continue to fuel the neighborhood’s economy. Using an urban park to stimulate economic development is not a new idea. In New York during the 1850s, Frederick Law Olmsted justified the purchase of land for Central Park by the increased value of land surrounding the park and the tax revenues it would generate. By 1864, there was a $55,880 net return in annual taxes over what the city was paying for land and improvements. By 1873, the park cost $14 million but was responsible for an extra $5.24 million in taxes each year. Golden Gate Park in San Francisco is responsible for $500 million to $1 billion of the market value of real estate within walking distance of the park. This value generates $5 million to $10 million a year in property tax revenue. In Oakland, Calif., a 3-mile greenbelt around Lake Merritt, near the city center, was found to add $41 million to surrounding property values. Chattanooga, Tenn., invested $356 million, from both public and private sources, in the environmentally progressive redevelopment of its downtown riverfront. Within the area, between 1988 and 1996, the number of jobs and businesses increased, assessed property values jumped $11 million — a 127.5 percent increase — and property tax revenues for both the city and county combined rose 99 percent for an increase of $592,000 per year. For many communities, the purchase of land for a park or open space is a one-time investment that boosts property values and swells the tax coffers long after the land is paid for. Open vegetated areas and even street trees can save billions of dollars by providing free ecological services, such as flood control and stormwater management, improving water quality and cleaning our air. Recently groups as diverse as the non-profit American Forests and the U.S. Army Corps of Engineers have been putting a price tag on those environmental benefits. An acre of open, vegetated land can absorb the first inch of rainfall before it runs off. When rain falls on open ground, it is filtered and cleaned by plants and soil and returned to either the atmosphere, ground water, and during peak flows, to streams. Ground covered with pavement or buildings does not absorb rainfall, which must be collected in drains and diverted to treatment facilities by storm sewers. Within current regulations, this storm water must be treated to remove solids, oils, fertilizers and other pollutants, and this is generally handled on site by constructed detention or retention ponds, and paid for by developers. An American Forests study, documenting the loss of trees in the Puget Sound region between 1972 and 1996, found there was a 37 percent decline in areas with high tree coverage (greater than 50 percent) and a near doubling of the areas with low tree cover, set at less than 20 percent coverage. This resulted in an increase of peak storm water flows by 35 percent. Replacing all this capacity with engineered systems would cost $5.9 billion. According to the Army Corps of Engineers, flood damage in the U.S. averages $4.3 billion per year. Along the Napa River in Northern California, floods have caused an average of $10 million in damage every year since 1960. Like many other rivers, it has been channeled, dammed, retained and dredged, but seasonal peak flows still defy engineering interventions. Finally the Corps decided to “let the river be a river” where soft undeveloped land and wetlands within the flood plain can absorb the peak flows naturally. Five hundred acres of flood plain land are being purchased, homes demolished, levees lowered and bridges razed. It will cost $160 million to solve a problem that has caused $500 million in damage since 1960. Communities nationwide spend billions of dollars to filtrate contaminants out of drinking water. When watershed lands are developed, lawn and garden chemicals, oils, sediment and septic overflow get into sources of drinking water. Many communities are realizing that it is cheaper to keep water clean than to filter it. For example, New York City found it would cost $1.5 billion to purchase watershed lands to protect upstate drinking water supply and $6 billion to $8 billion to build a filtration plant if those lands were developed. Trees are essential to the air we breathe. Through photosynthesis, trees absorb carbon from carbon dioxide and return oxygen to the air. Other pollutants are also removed such as nitrous dioxide and sulfur dioxide. In the Puget Sound region, trees remove 78 million pounds of pollutants per year. This represents a value of $19.5 million if the air were cleaned by industrial means. Open spaces are the natural capital for our communities. They bring pleasure, recreation, and places for community celebration and spiritual retreat. They are essential to our life, health and welfare. Preserving, planning and providing for them is an investment we all profit from. The question for citizens, government and developers is can we afford not to make this investment?